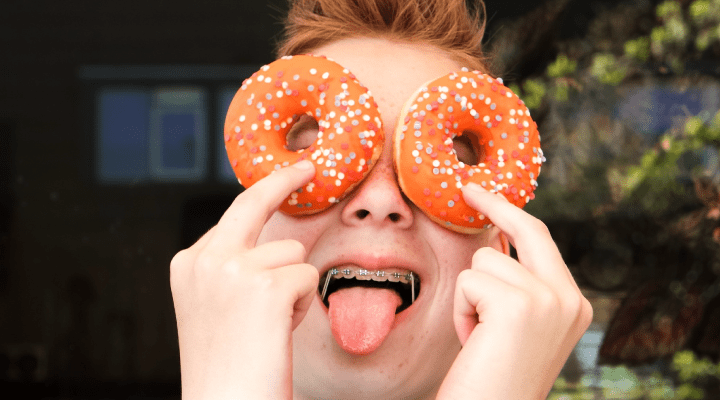 Anyone who has worn them knows that there are certain foods to avoid with braces, but those new to them may not know what you can’t eat with braces. Though it’s hard to resist tossing your favorite caramels or Starbursts into your mouth, it’s important to stick to this non-sticky rule. Soft candies can break or loosen braces, which can have a negative impact on the orthodontic process. Whether hard or soft, sodas or sports drinks—sugar has a negative impact on teeth. The sweet stuff stays on your smile after consumption, generating excess enamel-destroying acid. This can lead to numerous issues including tooth decay—even gum disease. If you must indulge in a sugary snack or drink, make sure to rinse your mouth with water after consumption. And once 30 minutes has passed, brush off the remaining residue. Ice cubes (when chewed) and hard edibles like popcorn and pretzels are on the list of foods to avoid with braces. This also applies to healthier items like apples, nuts, carrots and corn on the cob. They can bend or break critical pieces of your braces, resulting in another visit to your orthodontist. The good news? You don’t have to completely avoid all of these items. Modifications can be made to make eating easier and safer. Enjoy corn off the cob and cut apples and carrots into smaller, easier-to-chew pieces. There’s no need for your diet to suffer while you work on your smile. Since you’re already adjusting your diet, you may as well add more healthy foods into your routine, including plenty of fruits, vegetables, and lean meats. A balanced diet—including drinking lots of water—will ensure tip-top teeth once you’re braces-free.